The arrests took place shortly before China President Xi Jinping visited the United States in September 2015 when both heads of states agreed that neither side will participate in commercial espionage against one another. Now, those suspected hackers have turned out to be the ones in connection with the OPM hack that resulted in the theft of personal details of more than 21 Million United States federal employees, including 5.6 Million federal employees' fingerprints. 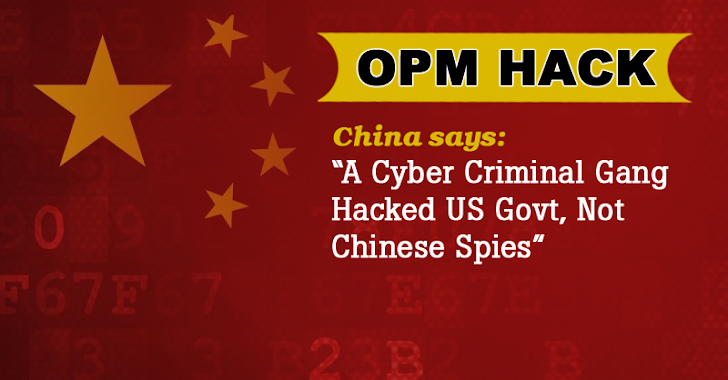 Citing an "investigation", the Chinese government said the OPM hack was actual "a criminal case" rather than a state-sponsored attack as the US government had suspected, Chinese media outlet Xinhua News Agency reported. Some unknown US federal officials had previously blamed China for the attack, though, they did not publicly point their fingers at the Chinese government. No further details regarding the investigation were provided yet or whether the United States or Chinese government had conducted the investigation. However, US government has urged for more detailed information sharing, though, White House spokesperson told Reuters that the first U.S.-Chinese dialogue was "an important step" in addressing US concerns about Chinese cyber-espionage. So, now let’s just wait till June, when both the countries would meet again for the second cyber security ministerial talk in Beijing.